Face aux stigmatisations des minorités en France, Stéphane a créé la Coopérative Indigo, qui encourage les interactions sociales et promeut le dialogue et l’entraide au-delà des classes sociales et de l’appartenance culturelle. Avec Eloquentia, il permet aux jeunes, du collège à l’université, de s’initier à la prise de parole en public. Élèves et étudiants gagnent ainsi confiance en eux, en leur capacité à contribuer activement et positivement à la société. Pour aller plus loin et connecter les personnes de tous horizons, il lance en 2017 Indigo, premier réseau social solidaire qui crée un nouveau système économique basé sur la générosité, dont le but est de faire émerger une vague d’entraide internationale. Lancé en Seine-Saint-Denis, le concours Eloquentia a été répliqué dans 4 universités en France. L’organisation intervient dans près de la moitié des collèges de Seine-Saint-Denis. En 2016, le documentaire sur le concours, A Voix Haute, a été visualisé en ligne plus d’1 million de fois en 7 jours. La version longue est sortie au cinéma en avril 2017, et a fait plus de 200 000 entrées. Plus de 25 000 personnes se sont déjà inscrites au réseau Indigo, en France, Grèce, Portugal... Le lancement de la bêta-test ouverte au grand public a eu lieu en mai 2017. Exerçant sous le pseudonyme SdF, Stéphane est un artiste-entrepreneur menant sa réflexion sur le mélange des opposés: “Indigo” est son travail d’association harmonieuse des couleurs opposées dans nos imaginaires, le rouge et le bleu. En 2012, il crée la Coopérative Indigo, structure qui incarne la transposition de son concept artistique au cœur des interactions quotidiennes. Pour créer du lien social, il axe ses projets sur le triptyque : Penser (Les Arènes), Parler (Eloquentia), Agir (Indigo). Cette description du travail de Stéphane De Freitas a été rédigée lors de sa sélection comme Fellow Ashoka en 2017. Built from his own experiences, Stéphane has developed the concept of "gathering opposites.” In a French context where social cohesion is increasingly crumbling, he bridges the gaps in the community by activating two powerful levers to peaceful coexistence: dialogue across differences and our desire to help each other. Starting in the most deprived area of France, Stéphane has built a new eloquence-based educative experience to equip hundreds of young people with the confidence and skills to express their voice and experiment with their power to be full and active citizens. With the intention to go a step further in effectively connecting people from all walks of life, he is also developing the first ever social network that incentivizes generosity to raise a global wave of mutual help. In a context of deep distrust and stigmatization of minority populations in France, Stéphane has created a framework for encouraging peaceful social interactions and incentivizing dialogue and mutual support across cultural and class lines. Stéphane believes that in order for us to peacefully coexist, we must bring together the opposites in society to foster real dialogue and civic engagement. Through Eloquentia, a model that uses the acquisition of public-speaking skills as a lever to reach one’s full potential, he empowers marginalized populations as full citizens. Stéphane has developed a unique methodology to equip students in universities and secondary schools with the technical skills and support they need to express their ideas and frustrations while developing their self-confidence, cultivating a strong sense of empathy and a sense of belonging to the French society. He began in Seine-Saint-Denis, the French department with the highest poverty and criminality rates in France. Stéphane has packaged different eloquence-based personal development programs that have mobilized thousands of people over the last four years. In addition, Stéphane aspires to generate a global wave of mutual help through activating an international community of individuals that are ready not only to peacefully express themselves and listen to each other but to go one step further and effectively help each other. To achieve this, Stéphane is creating the first ever non-profit social network that combines virtual currency with a mechanism that rewards solidarity (giving products or services, doing charity work, etc.). At a time of global economic, social and political crisis, social cohesion in France is particularly jeopardized by unsuccessful integration policies. As the social divide deepens, minority populations increasingly feel that “they will never be French.” Those groups that feel the most stigmatized and rejected by the system, increasingly build their identity against it. This is exacerbated by how politicians and the media portray these fringe populations - the voices of those excluded are not taken into account and are frequently treated with ignorance and/or stigmatization rather than curiosity and understanding in the public eye. Youth are particularly impacted as they are portrayed and seen as part of the problem - not as part of a potential solution. This deeply affects their self-confidence and clouds their vision for the future. In reaction, with their social identity questioned and devalued, youth - and minority communities overall - turn inward and develop their own social and linguistic codes that result in further isolation and catalyzes a vicious cycle of social tensions. In addition, the French education system does not provide these young people with the necessary networks and/or communication codes and skills to facilitate their social integration. There is a historical precedent for teaching the theory of democracy rather than the avenues for practicing it. Thus, apart from instructive lessons on democracy, youth do not learn pathways for self-expression or have opportunities to develop a sense of active citizenship. Overall, the interactions between marginalized youth and the larger population are limited, further exacerbating existing mistrust and skewed perceptions and preventing opportunities for altruism and community development. Even though 72% of French society consider themselves altruistic, only 3% declare that they have helped someone they did not know (92% helped people they did know). There is great need for increased interactions between different population groups in French society as it is the basis for improved perceptions and increased community building. New technology could play a considerable role in connecting those with time, intention and finances to those in need; building social fabric between the larger French population and minority groups. The tech platforms that do exist are typically profit motivated and/or inapplicable at a national or global scale. There is great opportunity for using technology to connect individuals from different social groups and invite everyone to contribute towards society building. Stéphane is empowering the most excluded youngsters to discover their inner self, express their ideas, actively participate in democracy and “reconnect” with society through public-speaking based educative experiences that are connected to real professional, cultural or civic opportunities. Beginning with Seine-Saint-Denis - the youngest, most impoverished department in France (28.8% of the population is under twenty years old and 24.8% fall below the poverty line) - Stephane has pioneered a sixty-hour program that runs over six weeks at the University of Saint-Denis that mixes debate, rhetoric and theatre with professional coaching and a public speaking contest. This program, called Eloquentia, is a lever for students to connect to the business world, through sessions with business professionals that help them understand business norms and social codes, prepare for interviews and secure job opportunities. Eighty percent of students that have participated have reported increased self-confidence and seventy percent have found professional opportunities through Eloquentia’s seven corporate partners. Although university students go through the program, the public speaking contest is open to any individual living in Seine-Saint-Denis. Over hundred people participate each year but thousands are mobilized at the final event. Assisted by Stephane, teams of empowered students are now replicating Eloquentia in 4 other universities. In 2017, Eloquentia will organize the biggest University public speaking contest in France. 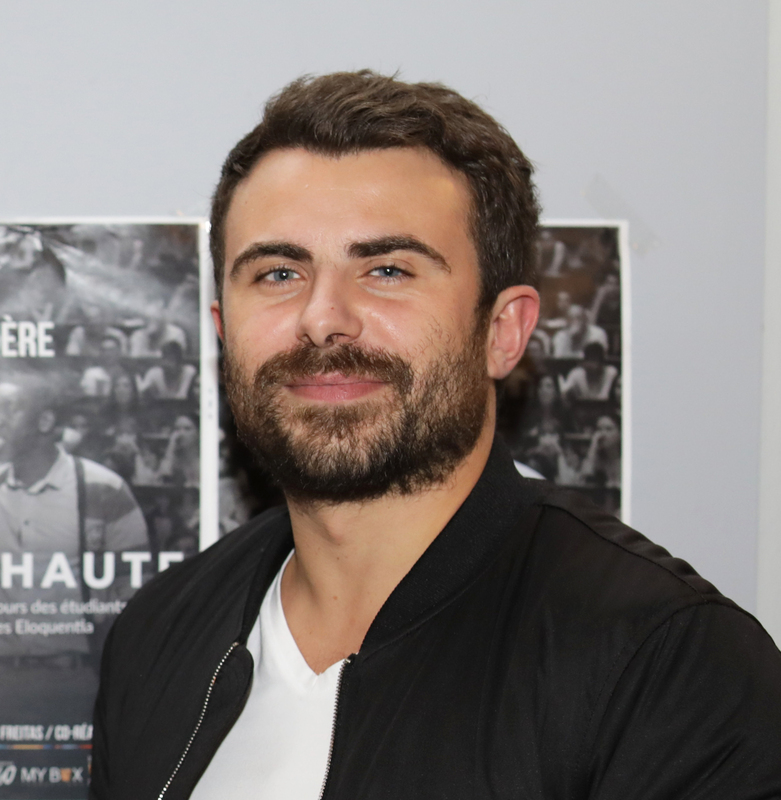 In order to reach a larger and younger audience, Stéphane has replicated the methodology into secondary schools, now impacting 57 out 125 secondary schools in 30 cities of Seine-Saint-Denis with different programs, including a student department council that empowers 114 ‘super school representatives’ (two in every secondary school) to strengthen their debating skills and actively animate and contribute to a democratic process within their school, through training sessions, discussions in schools twice a year and plenary assemblies three times a year. Within 4 years, Eloquentia has become the second non-profit organization impacting the largest number of youngsters in Seine-Saint-Denis, impacting more than 600 young people. In 2017, Stéphane will deploy a digital democracy tool to extend its impact scope by engaging 2500 secondary school students in real-life democracy processes. Stéphane’s strategy also includes a strong media component. Throughout the process, Stéphane has strategically selected and engaged cultural icons (artists, opinion leaders, etc.) with very different views as mavens to create media traction and embody the fact that divergent opinions can provoke dialogue rather than violence. In November 2016, Stéphane released a truly inspiring documentary sharing the Eloquentia experience on a national TV channel in France. Within 7 days, it was seen about 1 million times – thus convincing more young people and potential partners to be a part of the Eloquentia adventure, and triggering a positive mindset change about marginalized youth. In order to take his work a step further in effectively (re)creating wide social interactions between social groups, Stéphane is using the power of technology to pioneer a new, non-profit, fast-growing social network that incentivizes mutual help amongst citizens. An algorithm combining a virtual currency system with a coefficient enables the more generous users (those who give goods or services or volunteer for NGOs) to access goods and services at a lower ‘price’. This ‘the more you give, the richer you become’ model sparks a paradigm shift by showing that large scale solidarity exchange is possible. 25,000 plus people have already subscribed to the Indigo social network (and 700 new users subscribe every week without any communication efforts), with trigger communities in France, Greece, Portugal and Ivory Coast – where he strategically started by engaging populations who are the most in need, such as the refugees arriving in Greece. The alternative Indigo system is indeed particularly helpful for people who have a limited access to good or services or living in a country where the classic financial system is either corrupted or crumbling. What is more, Stéphane catalyzes this change by engaging well-known ambassadors, across France and beyond, thus generating a strong interest among national media players, like CBS (a movie is being produced on the Indigo ‘bet’). As the son of a mechanic and a baker, Stéphane grew up in Aubervilliers in Seine-Saint-Denis, the poorest department in France. At the age of 16, Stéphane became the youngest professional basketball player in France and was catapulted into an entirely new, privileged environment that was totally disconnected from where he grew up. This cemented for Stéphane how prejudice can harm social cohesion - a lesson he’d learned personally while being bullied for his Portuguese origins. He quickly realized that he did not have the capacity to express himself in the same way as many others and that language has the power to isolate or to drive dialogue. It was this fundamental life experience that deeply anchors the principle of “bringing opposites together” that underlines Stéphane’s work. At 18, Stéphane abandoned his basketball career to focus on his studies and obtain his high school diploma. He went on to pursue a Master Degree in Law at Assas University and an MBA at ESSEC Business School. While at ESSEC, intrigued by the notion of politics as a mechanism for building social cohesion, he became involved in the 2012 presidential campaign. Instead, he realized how blocked and short-term oriented political power in France is. While writing his thesis on peaceful conflict resolution, Stéphane’s vision of a solidarity-based global society begins to take shape. His thesis director challenged him to write a concrete plan to spark real change at a global level. In 2012, Stéphane had a critical accident and he promised himself he would implement that plan. He started by launching “Les Arènes”, a series of discussion circles that gathered opinion leaders from various origins and with diverse points of view to debate subjects illustrating how the old, vertical-pyramid world was collapsing and the challenges and opportunities that this provoked. At the same time, he created links with the University of Seine-Saint-Denis, foreseeing that this university should be the symbolic starting point of the positive revolution he planned. Stéphane developed the concept of Indigo - with the metaphor of mixing blue and red colors, which we tend to use in contrast to each other, as a conceptual message to show that, more than ever, humans are together and connected to each other, especially thanks to technology. He wanted to show that a “gathering the opposites” is necessary and possible. This concept has underpinned Stéphane’s entrepreneurial venture, La Coopérative Indigo for 4 years. He has based all actions since then on the three human behaviors he sees as necessary to build collective will, or what he refers to as being together: thinking together (Les Arènes), talking together (Eloquentia) and helping each other (Indigo).